Aida fabric has a precise square-patterned weave with visible stitching holes that makes this fabric easy to use and allows the needle to easily glide through the holes. The number or count indicates how many squares/stitches there are per inch of fabric. Each square represents a cross stitch. DMC Aida is available in a variety of different counts including 11, 14, 16 and 18. The smaller the fabric count the larger the squares. For example 11-count Aida fabric has 11 squares/stitches per inch. An Away Knot is one of two types of knots used in embroidery that allow you to anchor your embroidery thread without having a permanent knot on the back of your project. A form of needlepoint, primarily worked in upright long stitch or satin stitch, following a charted design. It is traditionally worked on mono canvas over multiple squares of canvas, forming a repeating, geometric pattern. The term Bargello refers to not just a stitching technique, but also to motifs created by the change of colours in the stitches. Blending/tweeding thread is when the needle is threaded with two colours of thread to give a more subtle colour shading. To create unique beautiful designs you can combine strands of different threads. One strand of DMC Light Effects looks beautiful when combined with one strand of DMC Mouline Stranded CottonThread. Some designs call for blending your thread. You may also see this referred to as Tweeding. A light weight pin-able board with a fabric covering that’s printed with a grid of squares. The grid is used as a guide for squaring the canvas during the blocking process. Tapestry/Needlepoint is often referred to as canvaswork. You work the stitches over a canvas fabric, also known as a ground. 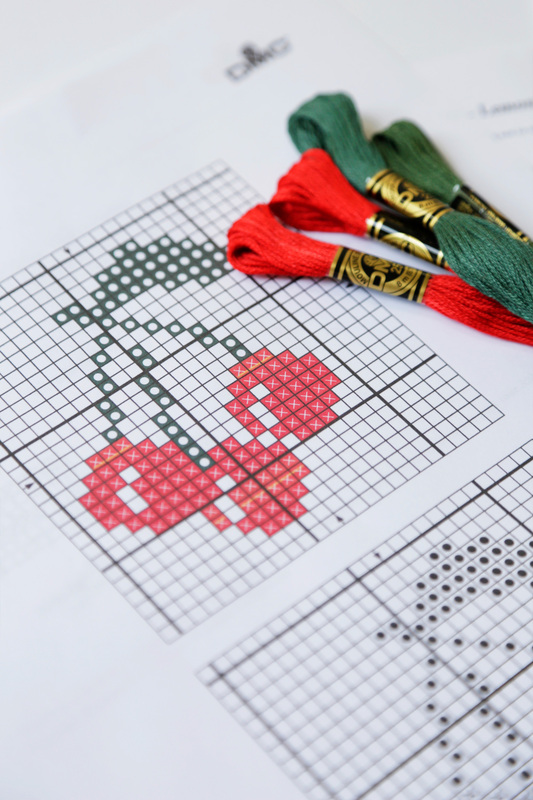 Cross Stitch starts with a simple X shaped stitch that is commonly embroidered with thread on an evenweave fabric. The cross stitch is repeated numerous times to create a design. Counted cross stitch designs are made by following a grid or chart where each square that contains a symbol represents 1 stitch. DMC Mouline Stranded Cotton Thread is the highest quality and most widely used thread in the world. It is made from long staple 100% Egyptian cotton and mercerised to give a beautiful sheen. There are over 450 colours of DMC Mouline Stranded Cotton Thread. Each length of thread is composed of six individual strands, allowing you to adjust the thickness of your stitching by using a different number of strands. Embroidery hoops are used to keep your fabric taunt as you stitch. The term evenweave refers to the fabric having an even number of weft and warp threads per inch. Warp threads run the entire length of the fabric, while the weft threads run side-to-side, from selvage to selvage. The thread count for evenweave fabrics is determined by this number – for example, 22-count linen has 22 vertical warp threads and 22 horizontal weft threads per inch of fabric. The higher the count number, the finer and closer the weave will be. After finishing your cross stitch piece there are many ways you can “finish” the design into a beautiful personalised home décor object, or simply frame it and hang it on your wall. Click here for some innovative finishing ideas from DMC. Finished Design Size refers to the actual space the stitched design takes up on the Cross Stitch Fabric. The count of the Cross Stitch fabric affects the finished design size. The higher the count of the fabric, the smaller the finished design size will be. Half stitches, quarter stitches and three-quarter stitches are often called fractional stitches because they are divisions of the cross stitch. Fractional stitches are much easier to do on an evenweave material. On Aida, the needle needs to punch through the middle of the little square in order to complete the stitch. No "punching through" is needed on an evenweave, as the needle simply goes between the two threads. Frog or Frogging is a slang term used by stitchers to refer to removing stitches when you make a mistake. When you take a stitch out you have to “rip it, rip it”. The ground refers to the tapestry/needlepoint canvas. 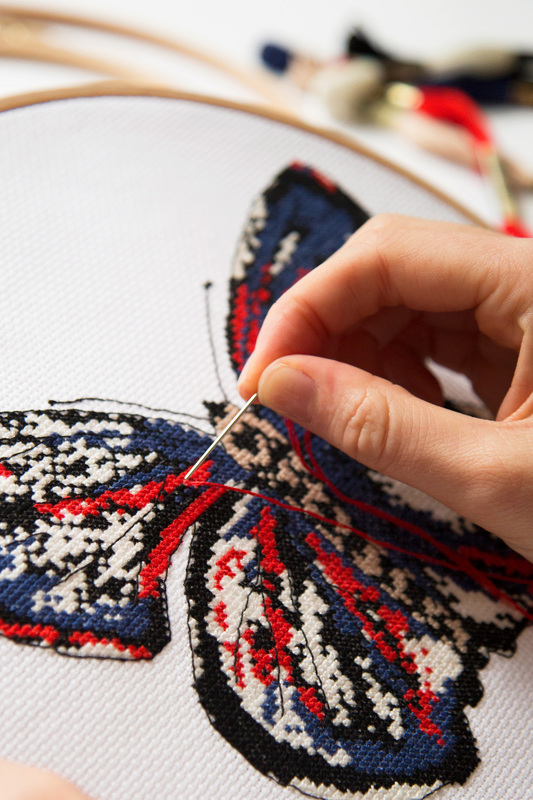 Instead of holding fabric in a hoop or frame when doing Cross Stitch Embroidery, some experienced stitchers prefer to hold the fabric in their hands ("in the hand"). When stitching “in the hand”, special care must be taken to maintain the tension. If stitches are too loose, the project will look messy and if they’re too tight, the fabric may be warped and misshapen. A popular type of needlepoint canvas that has a single horizontal thread, and two finer vertical threads that wrap and twist around the horizontal thread to create a locked mesh at the intersections (hence the name “interlock”). Projects worked on interlock canvas tend to have less distortion after stitching due to the locking of the mesh. Also, stitches stay where you put them, unlike mono canvas where the stitches can move due to the intersections not being connected or "interlocked." An embroidery laying tool is used with stranded threads, ribbon, or other embroidery threads when a smooth, flat finish is desired. Related to the railroading technique. Linen is an evenweave fabric. An evenweave is any fabric which has the same number of threads per inch in both the vertical and horizontal directions. For Linen there are natural variations in the thickness of the threads, but the thread count per inch is consistent. The higher the count number, the finer and closer the weave will be. Linen is generally worked over two threads. Fractional stitches are much easier to do on linen fabric, than Aida. No "punching through" is needed on an evenweave, as the needle simply goes between the two threads. Refers to canvas sizes, or holes per inch. For example, 14-mesh/count canvas has 14 holes – or openings in the canvas – per inch. A treatment that most DMC threads get during the manufacturing process that gives the threads a lustrous appearance and strengthens them. The process was devised in 1844 by John Mercer. DMC Corporation was the first textiles company to utilise this treatment. A type of single thread woven needlepoint canvas where both the vertical and horizontal threads are the same diameter and the threads are spaced the same distance apart. Mono canvas has a certain amount of “give’ to the fabric and is the choice canvas for cushions and upholstery. It’s a good idea to remove your needle from your project when you are not stitching to prevent unsightly holes that can stretch your fabric. You can “park it” on a magnetic needle minder to hold your needle safely close by. When stitching on evenweave fabric, stitchers often refer to stitching "over two" threads. This means that stitches are placed over two threads in the weave of the fabric. This term may also be used in indicate to stitch over two squares of Aida fabric instead of stitching over one square. A tapestry/needlepoint canvas that has a double thread canvas where both the vertical and horizontal threads are woven in pairs which create alternating large and small meshes in the same weaving to accommodate both large and or small stitches. Penelope/duo sizes are expressed with two numbers to describe the counts of both meshes in the canvas such as 10/20. This canvas is perfect for décor items and for a mix of intricate and more quickly stitched large background stitches. Needlepoint and Petite Point are sometimes mistakenly used interchangeably but they have different meanings. Petit Point is comprised of very small fine stitches and allows for greater detail in an area of a design. Plainweave refers to any fabric used for embroidery that does not have an easily recognisable even weave, of densely woven threads. Railroading is a term used by stitchers to describe a technique of smoothing down your stitches with a laying tool or tapestry needle so that thread strands lay side-by-side, like the rails of a railroad track. Railroading produces smoother stitches, so the final project will look neater. Smoother stitches mean better thread coverage as well. To use this technique after you stitch each half stitch, use your tapestry needle to smooth the stitches as shown. You may also use a larger sized tapestry needle or a tool specifically designed to smooth stitches known as a laying tool. A scroll frame is handy for larger projects to keep your fabric taut as you stitch. The excess fabric can be rolled into the frame to accommodate lengthy embroideries. The selvage is the edge on either side of a woven fabric which has been finished in the manufacturing process to prevent the edge of the fabric from unravelling. DMC invented the concept of a pull-skein. All DMC Thread is available in a skein put-up which means the thread is wound into a loose coil. The "stab" method, is used by most beginning stitchers. The stab method involves moving the hand back and forth from the front of the fabric to the back of the fabric. The needle is "stabbed" into the front of the fabric, left there, and then pulled through from the other side. The stab method is effective when using a hoop or frame. This method of stitching does not distort the fabric and assures that the stitch is placed properly. The sewing method is used by stitchers who prefer to hold the fabric in their hands instead of in a hoop or frame. The needle is inserted into the fabric and pulled up in one continuous sewing motion while the other hand is holding the fabric. When using this method it is difficult to keep an even tension and threads are more easily twisted making often making them difficult to control. This method is NOT recommended for beginners because it can stretch the fabric and distort your stitches. Sometimes cross-stitch is done on designs printed on the fabric. This is called stamped cross-stitch. The stitcher simply stitches over the printed pattern. These projects are very easy to complete because all you have to do is follow the squares and the colour of the squares that you see. Sometimes the design printed on the fabric are the same colours that you will use to stitch the pattern. Other patterns are just printed in blue or black and you still have to follow a printed pattern to get the colours right. Floor and table stands are available in a variety of styles and materials. These stands are a valuable tool because they hold the fabric in place allowing you to keep both hands free for “two handed” stitching. Stands offer various adjustments enabling you to arrange the height and angle of the frame to your liking while making it possible to sit comfortably in your favourite chair. Many stands come with scroll frames that can also be detached for portability. Also known as fractional stitches and partial stitches, refers to a section of a stitch made when the area to be stitched is too small to fill an area in its entirety, or when the boundaries of the stitch might extend into an unwanted area. Stretcher bars serve the same purpose as embroidery hoops and scroll frames. Stretcher bars are joined to make a frame that embroidery fabric is stretched onto and held into place with tacks. They serve the same purpose as embroidery hoops and scroll frames. Needlepoint is also often referred to as tapestry. Traditional tapestries are really woven wall hangings, used to insulate stone walls and keep the heat in the early 14th and 15th century. Modern day tapestries are usually printed canvases that are stitched in half cross stitch or continental tent stitch. Tapestry Needles have blunt, rounded tips with large eyes. The blunt tips are perfect for passing between the fibres in needlepoint canvas, rather than piercing them, as well as Aida fabric for cross stitch. These needles come in various sizes and selecting the needle size depends on thread size and the type of canvas or Aida fabric count. Remember the rule is, smaller the size of the needle, the larger the eye and thicker the needle. DMC Tapestry Wool is a soft smooth non-divisible 100% wool yarn. This type of yarn is normally worked on larger count canvas sizes 10 to 14. Tapestry Wools gentle twist and thickness provide excellent canvas coverage with a smooth, even texture. To create smooth uniform stitches it’s important to pull each stitch with the same amount of tension. If the stitch is too loose it will appear limp and if the stitch is pulled to tightly the fabric will distort and the weave of the fabric. As you stitch, consider how each stitch is covering the fabric and how evenly a group of stitches lie upon the fabric. For a uniform look it’s worth taking your time to make each stitch properly. Tension is also used to describe the tightness of the fabric in a hoop. The fabric should be tight enough that it does not sag in the middle, but not so tight that it distorts or damages the fabric. Embroidery Tracing Paper gives you the flexibility of transferring any design onto fabric for a unique look. Embroidery Tracing Papers are wax-free carbon papers that come in several colours. A stitching slang term that refers to an Unfinished Object. Some stitchers will start a project and then get excited about a new project and start that one, resulting in some unfinished projects laying around. Waste canvas is a temporary canvas used to work cross stitch, needlepoint or counted thread stitches onto regular plainweave fabric s found on clothing and home décor items. A clear canvas used for counted thread work that is easily dissolved in hot water once the stitching is completed. Similar to waste canvas in that it makes it possible to stitch on any regular plainweave fabric. Water-soluble pens and pencils are used to transfer a design onto fabric temporarily. The marked lines wash out when the item is laundered or blotted with a damp sponge.